I’m unable to download the SVG Gallery tool v.2. Database errors trying to search for it at DataManix. And your submission form doesn’t work on this page at TheBrainBasket. 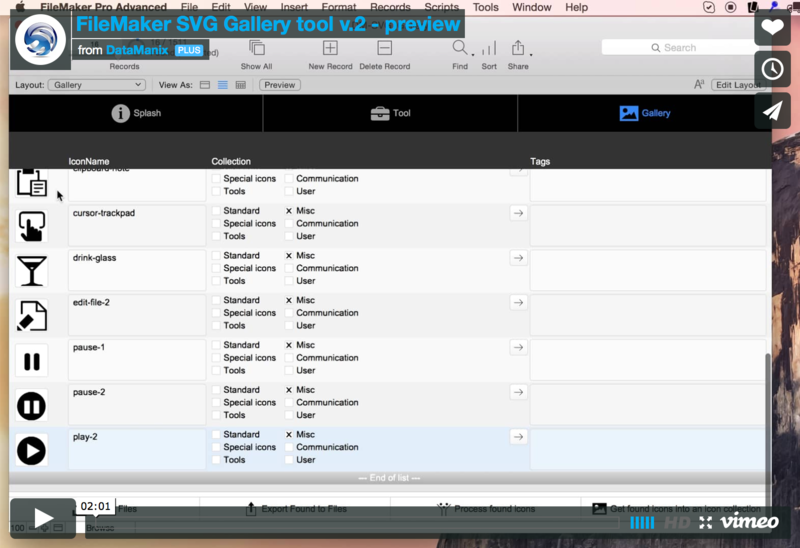 Can you please email me the SVG Gallery tool v.2? Thank you! We had to restart the server. It looks like you have not installed the BaseElements plugin, that is included in the SVG Gallery tool. On the first layout, there are buttons in the bottom of the screen to install the BaseElements plugin for MAC, Windows 32-bit or 64-bit. You can look at the BaseElements website to download the most recent version of the BaseElements plugin. I have tried to create a button bar from a small found set of the collection that comes with the solution. Although the dialogue tells me it is completed, nothing is added to my clipboard. Have you installed and enabled the BaseElements plugin ? – there’s a button to install it, but the one, distributed with the file is not the most recent.